Earlier this year I published a post telling you about Sarah & Josh, founders of the natural British skincare brand Skin and Tonic London, a niche British natural beauty brand that has been gaining recognition and accolades for all the right reasons, one of them being the return to simple skincare routine. Having used various brand products pretty much since they launched their products in 2014, now is the time to spotlight some of their products individually and let you decided which one might appeal to you and your skin type. Thistle Oil – We use this magical, organic oil in our Steam Clean and Brit Beauty Oil. Thistle oil is made by cold pressing the safflower seeds creating a very dry, lightweight oil that is very rich in omega 3 & 6 essential fatty acids which make up 80% of the oil, feeding the skin with important nutrients and keeping it plump and hydrated. These fatty acids help to lock moisture into the skin and prevent it from drying out. Unlike many oils, thistle is so light that it is absorbed into the skin without leaving residue. French Pink Clay – We love this transformative ingredient ! Gentle and detoxifying, we use French Pink Clay in our Gentle Scrub (which doubles up as a mask). It is the mildest of all the clays and can be used on dry/sensitive skin types to cleanse, refresh and remove dead skin cells. Rose Centifolia Flower Water – Made from beautiful, organic Rose Centifolia flowers that are grown and distilled in the French Alps in pure air and clean soil. This flower water is made by high-ratio extraction levels (1 kg of plant material to obtain 1 litre of flower water), ensuring maximum levels of aromatic molecules and active ingredients. Rose Centifolia flower water has a green, floral scent and that soothes, hydrates and balances the skin. We use this ingredient in our Rose Mist. German Chamomile – A midnight blue, inky oil this is an amazing skincare ingredient. Grown wild in France and steam distilled from the flowers. The oil contains high levels of Chamazulene, making it highly anti-inflammatory, anti allergic, antibacterial and cicatrisant (aids the healing of scar tissue). It is a key ingredient in our Calm Clean cleansing balm that gently removes dirt, whilst soothing, healing and reducing inflammation. Calm Balm, 50g, £23: this was one of the first products from the range that I have tried and almost instantly it became a ‘comforting’ skincare friend on days when muscles seemed achy, post workout, or mind has been hazy with frustration. Sometimes just lifting the lid and deeply exhaling its comforting smell was enough, so it is a good product to keep not just in your bathroom cabinet but bedside table or desk ( since then Skin & Tonic has also started doing handy ‘miniatures’ that are perfect for being dotted around the house, in a workplace, handbag or during the travels ). It also works well on helping clear the nose, if you feel a little congested or to calm restless kids after a busy day ( just gentle tab in clockwise motion on their temples ). In terms of texture and ‘feel’, it is a solid white-coloured balm that easily melts and sinks into the skin, leaving behind a soft veil of comfort – it is a bit more ‘firm’, compared to other balms in the range though. 6) Pat a small amount on very dehydrated skin at night and leave to hydrate and nourish through the night – wake up with happy, glowing skin. Steam Clean, 50g, £27: this softly soothing and nourishing cleansing balm smells of spearmint and eucalyptus, clearing the cobwebs from the mind, as well as gently but effectively cleansing the skin. I enjoy using this balm when it is cold outside, as it doesn’t strip the skin’s mantle but effectively lifts dirt and debris, as well as make-up, from your skin, leaving your skin a clean and soft canvas, ‘fertile’ for night-time nurturing and rejuvenation. The balm has a ‘slippy’ texture, which makes your fingers easily glide across your face, not dragging the skin and making for an enjoyable ‘massaging’ experience a long the way. By boosting the circulation and cleansing your skin properly but without irritating it, you skin will be perfectly ‘primed’ to receive nutrients that will allow it to be on ‘perfect’ form. 1) Massage a small amount into your face and neck. Soak the cotton face cloth in warm water and hold against your face for one minute, to steam and activate the essential oils. Breathe in deeply and cleanse away. 4.) Calm Clean can be applied to small skin irritations, bites or stings, as the German Chamomile & English Lavender are analgesic/ anti-inflammatory oils. 5.) Mix with mineral powder to create a nourishing, calming cream blush. 6.) Use to maintain ‘flyways’ or to help shape eyebrows. Gentle Scrub, 100g, £18: I first got this product as an unexpected ‘bonus’ to my initial purchase at Content & was quite taken with its sweetly uplifting smell. This is a gentle scrub that can be used daily several times a week, if you skin feels like it. The benefit is double, as not only is it gentle enough for sensitive skin, if that is your skin type, but it also ‘detoxes’ the skin thanks to the French Pink Clay. It can double up as a skin mask (please see Sarah’s tips below) and will leave your skin feeling fresh, clean and soft to the touch. It can easily form part of a nurturing ritual at the end of a day, when you let go of the worries of the day, observe your skin in the mirror, making a decision as to what it needs and mix this powder according to your decision on the skin treatment that night. 1) Add 1/2 tsp of powder to warm water to make a liquid paste. Massage onto damp face using gentle, circular movements twice a week to exfoliate. 2) Add a tsp of honey or yogurt to the liquid paste to create a hydrating face mask. Leave for 10-15 mins then rinse off with warm water. Use once a week as a mask. 3). Add a pea size amount of the Gentle Scrub with a drop of water and apply to spots with a q-tip, leave for 10 mins and then wash clean and moisturise. Calm Clean, 50g, £27: this heavenly cleansing balm, that is particularly suitable for dry and mature skin, has a beautifully unusual colour due the blue camomile flower oil. It has a gently soothing and easily ‘meltable’ texture – as soon as you dip your finger into the jar and the balm ‘meets’ up with the warmth of the tips of your fingers, it is like an instant synergy. Cleaning with it is a pleasure, whether you feel a bit frazzled in the morning or tired in the evening – inhale its calming scent, take a few deep breaths and a gentle calm with descend on you. It cleanses the skin effectively, even when you wear a ‘heavier’ foundation and leaves the skin soft and supple but don’t use it to remove your eye make-up. I sometimes add it to the ‘tops’ of my hands, when working at the desk and lacking focus and fairly quickly feel that cobwebs float away and calm concentration winning the reigns back. I would go on to say that among this brand’s cleansers, this one is my ‘best friend’ thus far. Lip Balm, 4.3g, £3.50: this lovely ‘baby’ comes in three flavours – naked, peppermint and lemon. Nurturing, non-sticky and non-lip drying, unlike some other counterparts on the market ( you know those lip balms that make lips feel drier the more you re-apply them during the day ?) . This one is gentle enough for the kids ( so do stock up, if you have boys or girls. Little girls particularly are keen, as many of their friends use their mothers lipsticks and so when mine asked for a lip balm, I happily obliged, letting her choose the flavour and explaining that a lip balm shouldn’t be shared, unlike a cookie and that she is as yet too young to use a grown-up lipstick ). I like using the Naked balm as a lip ‘primer’, before applying the red lipstick for example, especially if it has the matt texture and use Peppermint on those days when I don’t wear any colour on my lips, but still want them to feel & look beautifully cared for. The joy of simple skincare is that is helps enhance your beauty traits and makes you feel like you, just somewhat better. 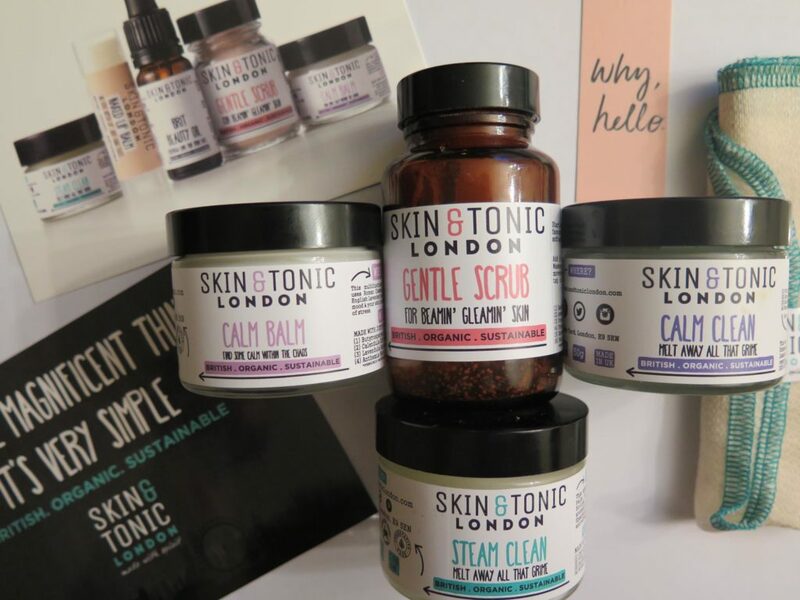 Another good point to know about Skin & Tonic, is that they have added miniatures (Calm balm, Steam clean, Brit beauty oil & Gentle scrub ) to their list of products, as well as a miniatures gift/travel set, so you can buy ‘minis’ to try the products, before committing to a fully-sized version of a product or use miniatures for your travels or keep them in your work desk, if you need to get ‘camera ‘ready’ before a work dinner date or social event straight after work. *Certified organic by the Soil Association; 100% natural and organic.